Antananarivo is the capital, largest city and the economic center of Madagascar. It was known by its French name Tananarive or the colonial shorthand form Tana until 1977. The larger urban area surrounding the city, known as Antananarivo-Renivohitra ("Antananarivo-Capital"), is the capital of the Analamanga region and of the Antananarivo Autonomous Province. The city is guarded by two forts built on hills to its east and southwest. This city of 1.4 million people is the doorway to Madagascar's rich biodiversity, which attracts ecologically and socially conscious tourists who are concerned with learning new ways to live on the planet. Poverty and the competition for agricultural land have put at risk the island's dwindling forests, home to much of Madagascar's unique wildlife and key to its emerging tourist industry. The island nation's economic situation is in large part a result of earlier economic stagnation caused by socialist policies and political instability. It has since discarded these policies and follows a World Bank and International Monetary Fund policy of privatization and liberalization. One of the challenges of modern times is to balance human needs with the needs to sustain biodiversity. This issue is clearly manifested in Antananarivo, and all of Madagascar. While the city and its surrounding area have environmental issues that include surface water contamination and soil erosion resulting from deforestation and overgrazing, much remains of its unspoiled natural habitats and unique flora and fauna. A theater in Antananarivo around 1905. Antananarivo, which is Madagascar's largest city and is its administrative, communications, and economic center, is situated in the center of the island length-wise, and 90 miles (145km) away from the eastern coast. The city occupies a commanding position, being built on the summit and slopes of a long and narrow rocky ridge, which extends north and south for about two miles (three kilometers) and rising at its highest point to about 660 ft (200 m) above the extensive rice plain to the west, although the town is at about 4,183 feet (1275 meters) above sea level. There are two seasons: It is hot and rainy from November to April, with temperatures of 70°F (21°C) in January, and cooler and dry from May to October, 58°F (14°C) in July. The Ikopa River skirts the capital to the south and west. The area of the urban municipality is 30.4 square miles (78.7 square kilometers). Madagascar, the fourth largest island in the world, is the home of five percent of the world's plant and animal species, 80 percent of which are unique to Madagascar. Among its most notable examples of biodiversity are the lemur infraorder of primates, three endemic bird families and six endemic baobab species. Environmental issues include surface water contaminated with raw sewage and other organic wastes, as well as soil erosion resulting from deforestation and overgrazing, and desertification in the surrounding countryside. The city is located 134 miles (215km) west-southwest of Toamasina, the principal seaport of the island, with which it is connected by railway, and for about 62 miles (100 km) along the coastal lagoons, a service of small steamers. Unlike most capital cities in southern Africa, Antananarivo was already a city before the colonial era. The island was probably uninhabited until Indonesian seafarers arrived in the first century C.E., probably by way of southern India and East Africa, where they acquired African wives and slaves. The written history of Madagascar began in the seventh century C.E., when Arabs established trading posts along the northwest coast. European contact began in the 1500s, when Portuguese sea captain Diego Dias sighted the island after his ship became separated from a fleet bound for India. Antananarivo was begun as a fortress circa 1625 by King Andrianjaka, and takes its name (the City of the Thousand) from the number of soldiers assigned to guarding it. For many years it was the principal village of the Hova chiefs and gained importance as they made themselves sovereigns of the greater part of Madagascar. The settlement eventually became a town of some 80,000 inhabitants. In the late seventeenth century, the French established trading posts along the east coast. From about 1774 to 1824, it was a favorite haunt for pirates. In 1793, Antananarivo was made the capital of the Merina kings, their large palace still overlooks the city from the top of the ridge. As the Merina dynasty, notably King Radama I, gained control of most of the island in the nineteenth century, Antananarivo became the capital of almost all of Madagascar. The French captured the city in 1895 and incorporated it into their Madagascar protectorate. At that time, the city had a population of some 100,000. Roads were constructed throughout the city, broad flights of steps connecting places too steep for the formation of carriage roads, and the central space, called Andohalo, was enhanced with walks, terraces, flower-beds, and trees. Water, previously obtained from springs at the foot of the hill, was brought from the Ikopa River, which skirts the capital. The population grew to 175,000 by 1950. French colonial rule was sometimes harsh; an uprising in 1947, was suppressed with bloodshed. After independence in 1960, the pace of growth increased rapidly. The military seized power in the early 1970s, and set up a socialist state. The economy went into decline and by 1982 the authorities were forced to adopt a structural adjustment program imposed by the International Monetary Fund. The Republic of Madagascar has a presidency, a parliament (national assembly and senate), a prime ministry and cabinet, and an independent judiciary. The "Urban Community of Antananarivo," which is bordered by the municipalities of Antananarivo-Avaradrano (east and north), Ambohidratrimo (west), and Antananarivo-Atsimondrano (south), is divided into six arrondissements. A mayor and 12 elected councillors govern the city. Antananarivo is also the capital of the province of the same name that has an area of 22,503 square miles (58,283 square kilometers). According to World Bank estimates, 70 percent of Malagasy live on less than $1 per day. Poverty and the competition for agricultural land have put at risk the island's dwindling forests, home to much of Madagascar's unique wildlife and key to its emerging tourist industry. Having discarded past socialist economic policies, Madagascar follows a World Bank—and International Monetary Fund—policy of privatization and liberalization. The economy of Madagascar is overwhelmingly agricultural, largely of a subsistence type. The principal cash crops are coffee, vanilla, sugarcane, cloves, and cocoa. The main food crops are rice, cassava, bananas, beans, and peanuts. In addition, large numbers of poultry, cattle, goats, sheep, and hogs are raised. Fishing and forestry are also important. The city is set in a rice-growing region. Industries process food products, tobacco, and manufacture textiles, and leather goods. Tourism, which targets the eco-tourism market, capitalizing on Madagascar's unique biodiversity, unspoiled natural habitats, and lemur species, is a growth industry. The city has an international airport as well as rail links with Toamasina (Tamatave), a seaport on the Indian Ocean. Antananarivo seen from the North-East. Antananarivo had a population 1,403,449 in 2001, while the province of the same name had a population of 4,580,788. Madagascar's population is predominantly of mixed Asian and African origin, though those who are Asian in appearance and culture are the minority. Ethnic groups include Malayo-Indonesian (Merina and related Betsileo) people, Cotiers (mixed African, Malayo-Indonesian, and Arab ancestry—Betsimisaraka, Tsimihety, Antaisaka, Sakalava), French, Indian, Creole, and Comoran. Fifty two percent of the population have indigenous beliefs, 41 percent are Christian, and seven percent Muslim. Antananarivo has about 50 churches in the city and its suburbs, including an Anglican and a Roman Catholic cathedral, and an Islamic mosque. English, French, and Malagasy are the three official languages. The Malagasy language is of Malayo-Polynesian origin, and shares much of its basic vocabulary with the Maanyan language from southern Borneo. Antananarivo hosts a campus of the University of Madagascar, the centralized public university system in Madagascar, as well as the Collège Rural d'Ambatobe, a museum of art and archaeology, and an astronomical observatory. Until 1869, all buildings within the city proper were of wood or rushes, but even then stood several timber palaces of considerable size, the largest being 120 ft (37 m) high. These crown the summit of the central portion of the ridge; and the largest palace, with its lofty roof and towers, is the most conspicuous landmark. Since the introduction of stone and brick, the entire city has been rebuilt and now contains numerous European-style structures, including the royal palaces, the houses formerly belonging to the prime minister and nobles, the French residency, the Anglican and Roman Catholic cathedrals, and several stone churches. 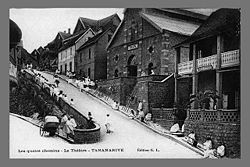 Because of the continuing bond with France resulting from French colonial rule, Antananarivo, as well as the entire island, has developed political, economic, and cultural links with the French-speaking countries of western Africa. Falling Rain Genomics, Inc. Antananarivo, Madagascar: Elevation = 1288m (Red dots are railways). Global Gazetteer. Retrieved July 9, 2008. Rajaonah, Faranirina V. 2005. "Antananarivo." Encyclopedia of African History. 92-94. Ralambomahay, Hery-Zo. 1991. 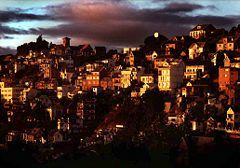 "Antananarivo: Beautiful, useful and enthralling." Museum. 170: 109-111. Madagascar BBC News Country profiles. Antananarivo Flags of the World. . This page was last modified on 1 April 2016, at 21:56.